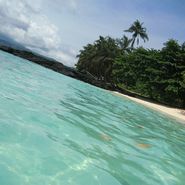 São Tomé and Príncipe This small island nation, 250km off the west coast of central Africa, is “the Galápagos of Africa”, according to Tom Barber of Original Travel. As in the Galápagos, isolation means there are numerous species of plants and birds that occur nowhere else and, depending on the season, visitors can also see migrating giant leatherback turtles and humpback whales. Unlike the Galápagos, visitors can stay on the islands (rather than on cruise ships), making it easy to explore the forests, extinct volcanoes and colonial towns. The surf scene on remote São Tomé – one of the smallest island nations on earth – is as extraordinary as its setting is exotic, finds Michael Scott Moore.